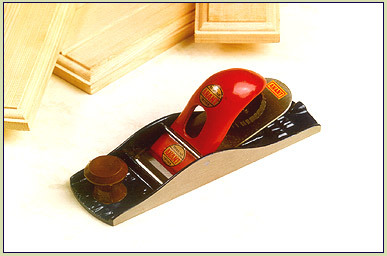 A general purpose block plane the cut iron of which is rigidly held by a knurled wheel and screw. A hardwood/Plastic front knob is fitted. The ANANT Block Plane is a handy, easy to use tool, mainly used when planing end grain, its use extending to many other small planing jobs. Body and Lever Cap : High grade cast iron. Cut Iron : High Carbon Steel. Stove enamelled ANANT blue. Base and sides ground and polished. Spare cut irons and parts are readily available.